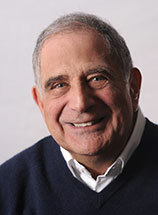 Internationally acclaimed author and media critic Jack G. Shaheen, a Pittsburgh native, is a distinguished visiting scholar at New York University. His lectures and writings illustrate that damaging racial and ethnic stereotypes of Arabs, Asians, blacks, Native Americans and others injure innocent people. He defines crude caricatures, explains why they persist, and provides workable solutions to help shatter misconceptions. Shaheen’s telling new book, A is for Arab: Archiving Stereotypes in U.S. Popular Culture, features photographs of objects and materials from the Jack G. Shaheen Archive at NYU on anti-Arab and anti-Muslim depictions. His other books are: Nuclear War Films, The TV Arab, Arab and Muslim Stereotyping in American Popular Culture, Reel Bad Arabs: How Hollywood Vilifies a People, and GUILTY: Hollywood’s Verdict on Arabs after 9/11. His writings include 300-plus essays in publications such as Newsweek, The Wall Street Journal and The Washington Post. He has also written dozens of chapters on stereotypes in college textbooks. He has appeared on national network programs such as CNN, MSNBC, National Public Radio, Nightline, Good Morning America, 48 Hours, and The Today Show. He has worked with writer-director Steve Gaghan on Syriana (2005) and producer Chuck Roven on Three Kings (1999). Among Dr. Shaheen’s awards recognizing his contribution towards a better understanding of our global community are: The Ellis Island Medal of Honor; The University of Pennsylvania’s Janet Lee Stevens Award; the American Arab Anti-Discrimination Committee’s Lifetime Achievement Award; and the Pancho Be Award.